Who'd have though my first web page with any content at all, even though uninteresting to most people, would be an obituary for a guinea pig. But there are a lot of pets out there who are loved by their owners and Louise was certainly no exception. 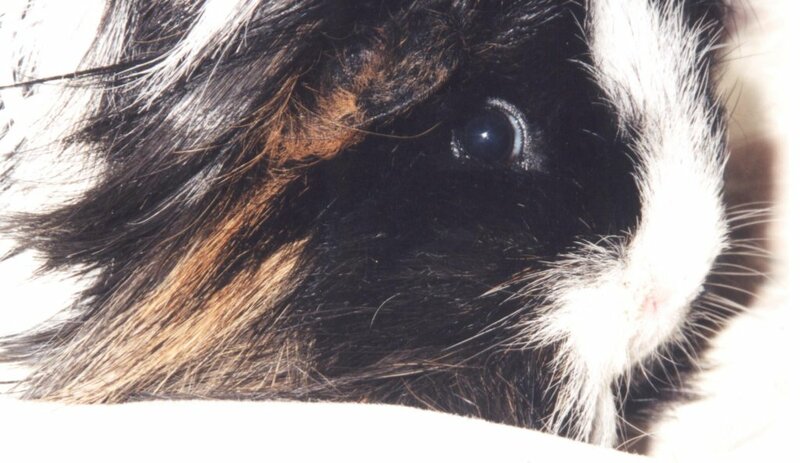 On Sunday, June 12, 1999, my wife Susan and I noticed that water consumption had gone down in our guinea pig cage, even though Louise seemed as lively as usual. On Monday, she seemed to be eating very little, drinking even less, and spent most of her time in the corner panting. By Tuesday she was even worse, eating and drinking almost nothing and hardly moving at all, so we took her and her sister Thelma, for company, to the veterinarian. After an X-ray and checkup, she was diagnosed as suffering from congestive heart failure. Her lungs were filled with fluid, and her little heart was beating much too rapidly. The vet prescribed some antibiotics and heart pills to dilate her blood vessels and arteries in order to take the load off her heart. Over the next few days we administered her medicine by rolling her in a towel, flipping her on her back and using an eye dropper to feed her antibiotics and crushed heart pills. But poor Louise barely had the strength to struggle, and took little interest in the bits of lettuce we would try to feed her to wash the medicine down. By Friday it was clear that Louise was not going to get better and we had a very hard decision to make. We left her sister at home and took Louise on her final trip to the veterinarian. After discussions of some alternate medicines that would only prolong her misery, we agreed that it was time to say goodbye. The vet took here in another room, gave her an overdose of anesthetic and brought her back. I am still filled with sadness when I think of Louise struggling to stand and finally laying on her side and dying quietly as we stroked her gently and whispered to her. What can I tell you about Louise the guinea pig? She was a long-haired Peruvian breed and only 6 weeks old when we brought her and her sister home from the pet store 5 1/2 years ago. They were two of the cutest little mops of hair you've ever seen. She was very dependant on her sister, judging from the piteous squeaks she would emit when her sister was removed from the cage, so it's lucky she was the first to go. I don't think she would have survived long if Thelma had gone from her life. Louise was well-traveled for a pig. She had been to Vancouver Island 3 times on the ferry, once even staying at the luxurious Wickaninnish Inn. She loved to eat and grew somewhat fat because of it, in contrast to her sister who is quite thin. Her favorite foods were Endive and Romaine lettuce, next to lawn clippings, but she would eat just about any vegetable or fruit. She didn't like to be picked up or handled much and always seemed to be looking at us suspiciously. But when she was in her cage in familiar surroundings she had the loudest chuckle of any guinea pig I've heard when you stroked her. She was a good pig, and my wife and I are going to miss her.